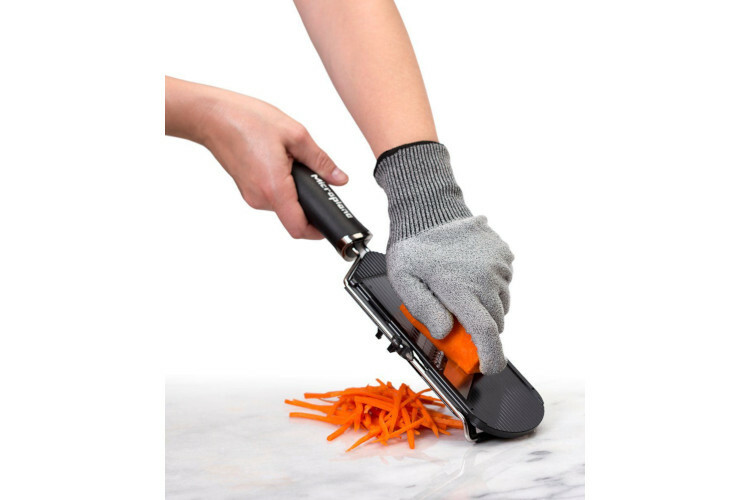 The Microplane Cut Resistant Glove allows for safer food preparation with its uniquely constructed, machine washable, light weight and comfortable design. Made from man-made fibers, the "one size fits most" glove molds quickly to fit either hand. You can use this glove for all your food preparation requiring sharp tools. Keep in mind that you still have to avoid the sharp edges just like you would if you weren't wearing it. The benefit comes in the case of accidental contact with a sharp edge. It may still damage the glove, just not your hand.